Home › ibiza › Tomorrow, Berlin, Renè Goldman presents: Ibizasoulon! 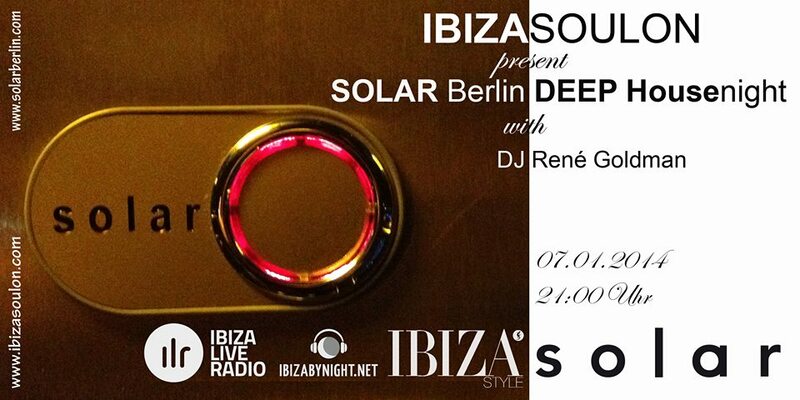 Tomorrow, Berlin, Renè Goldman presents: Ibizasoulon! Tomorrow 7th of January, starting at 21,00, Renè Goldman presents his amazing show.. Ibizasoulon! Renè Goldman is an appreciated Dj that played many times in ibiza (last summer he was guest dj in many prestigious locations including El Hotel pacha with Joan Ribas)..and now presents his appointment at Solar Berlin! Here you have the poster of the event..and if you are in Berlin..don’t miss it, because of Renè Goldman plays excellent music!! And this is a mixcloud of Renè Goldman! ‹ Friday, Ibiza.. A special event by Ibiza live radio at mozart!